Katherine Helen Davis was born in Chicago 25 Feb 1953 to Ethel Campbell and Wesley Davis. Her grandfather, Earl Campbell, performed with Louis Armstrong and Count Basie and her mother hunkered after her professional career as an opera singer. Katherine was raised in Chicagos infamous Cabrini-Green housing project in Chicagos north side and her family moved as soon as they could across to the south side in 1967. By then Katherine was singing in church and had listened for most of her life to the music of Ella Fitzgerald, Pearl Bailey, Dinah Washington, Muddy Waters, Mahalia Jackson and Etta James. Although she decided as a youngster to sing the blues (at the age of 13 she was chastised by the church choir director as sounding too bluesy) she had also been inspired by family members who were opera singers and decided to study opera at the Sherwood Conservatory of Music in 1982-1985 and then studied musical theory and drama at the Kennedy King College in Chicago. Meanwhile the south side of Chicago also provided Katherine with a plethora of Jazz and Blues clubs wherein she could hear the greats of both scenes on a daily basis. In 1987 a friend suggested that she audition for an acting job in a play produced by the Kuumba Theatre and Katherine landed the part. She went on to play both Ma Rainey and Bessie Smith and was critically acclaimed in the Heart of the Blues. Though her work in this production she made a number of valuable contacts and was soon singing both jazz and blues in clubs and festivals throughout the U.S, Canada and Europe including the 1986 Chicago Blues Festival where she sang with Erwin Helfer on piano (Shakedown Blues March 1972). In 1989 she recorded an album with the Chicago Victory Gospelaires and then in 1992 was recorded in Japan as part of the Louisiana Red Chicago Allstars compilation entitled Chicago Blues Night. She then produced an album in 1993 Live at the Orpheum Theatre and the same year recorded again with Roy Rubenstein and the Dixie Stompers. Three years later at the Chicago Blues Festival she met harmonica player Billy Branch and this led to an ongoing involvement in the Blues in Schools programme. In 1999 joined the upcoming Chicago band Mississippi Heat and it was their very tasty first three CD's that alerted me to Katherine. When Mud Morganfield came over for the first time he highly recommended that we book his friend Katherine Davis and we are pleased that at last we are able to fit in to her busy schedule. We have decided, because of the multi-faceted nature of her repertoire, to present Katherine in different formats. 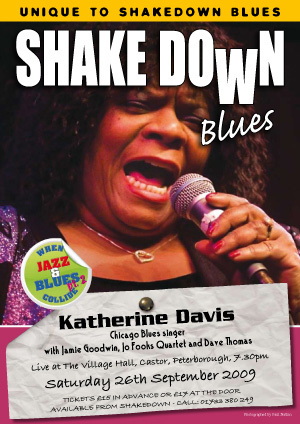 In Stamford the first set will be a set of classic blues from the 1920's showcasing songs by Bessie Smith, Ida Cox, Ma Rainey and Sippie Wallace together with James Goodwin on piano. The second set will be Chicago blues together with the full Dave Thomas Band. Buster Birch, drums augmented by Dave Thomas on guitar. With all this history and talent this will no doubt go down as one of the great Shakedown shows.